I was alerted to the work of Kylie Coles via Twitter and came away so impressed after seeing the beautiful bowls she turns out in her woodworking studio. True, the impractical shape makes these bowls purely decorative rather than dinner table friendly, but that's perfectly fine... some things in life should simply be admired. Kylie studied Contemporary Crafts at Manchester Metropolitan University in Cheshire, England, and calls her current conical series of work, Converging Forms. 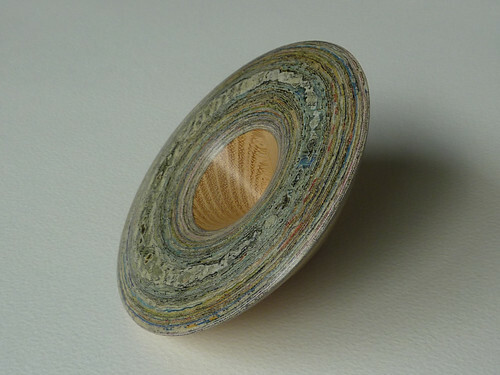 She layers discarded magazine pages or even Christmas wrapping paper, onto wood and turns it on a lathe. 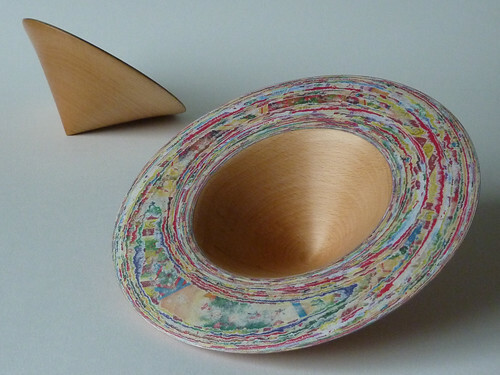 How did you happen upon the idea of combining wood with discarded paper? I was an undergraduate exploring line and form, in particular layering and revealing line. 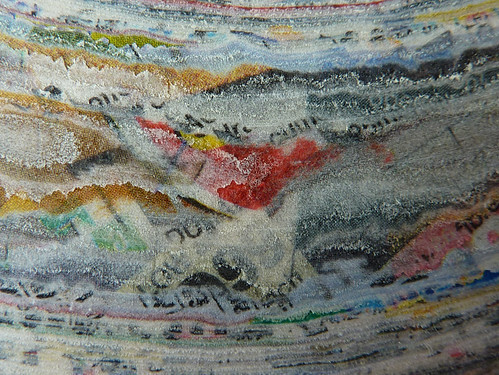 Working in mixed media, I had been making layered paper experiments, and also layering wood, plywood, and veneers, and turning them on the lathe, so I thought it would be good to combine the two. Experimenting with materials that come easily to hand in unusual ways was very much encouraged on the course, so it wasn't such a big leap as it seems. 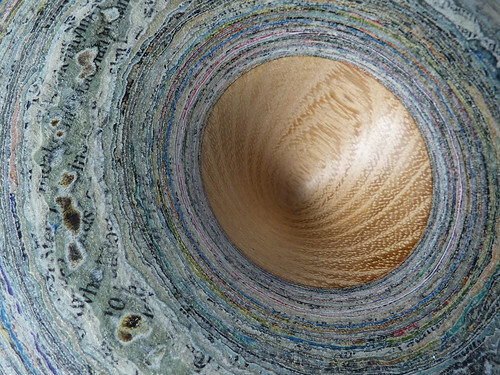 My favourite part is taking the layered up blank of wood and paper which at this stage looks very uninspiring, and cutting through it on the lathe to reveal its inner beauty. Also, when the wax goes on at the end, it really brings out the colours and warmth of both the wood and paper. it take to make a bowl from start to finish? In man hours it usually take six to eight depending on the size. However, because of the layering process it happens over about two weeks, so I work on more than one at a time. Kylie likens her work to "a fine balance between artistic control and serendipity." What an apt description! See more bowls on Flickr. Happy Thanksgiving to those of you in the U.S. and to everyone, I wish you a wonderful weekend. My brother-in-law is cooking the turkey for our family's celebration... and that's just one of the things I'm thankful for this year. Another that tops the list is all of you who visit All Things Paper - thank you! Gorgeous find Ann!, Some of her bowls on her photostream are unbelievably beautiful.Happy thanksgiving Ann. I can't access the holiday guide for some reason. What beautiful work, and so unique! Were I ever to own an art gallery, I would include this kind of art. Have a lovely Thanksgiving, Ann. what an interesting idea of layering the paper and wood. that bowl is so pretty. beautiful! What could be more beautiful than wood and paper together? I checked out the link to the paper ballerina lamps. They are gorgeous indeed! bowl is really awsome !!! Wow, those are gorgeous! Definitely a conversation piece!